Welcome to Brash Talk #7 the newsletter of the Polar Tourism Guides Association (subscribe here). We hope you are enjoying a break, or about to enjoy one, between seasons. It was interesting to see the ice conditions in the northern NW Passage/Bellot Strait region that put a stop to a number of planned NW Passage transits in the last couple of weeks. Plenty to cover in this issue so please explore it and catch up on all our exciting news. Traveling home from your Arctic season or have some downtime between seasons? Don’t forget to use that time to grab a coffee or glass of wine and update your Log. RCC Scheme – the final 6 weeks! Updated Drive a Zodiac PTQ and Explanation. While we were in the set up process of website and membership payments we were under the belief that the “system” didn’t have a way to revisit individual joining dates and membership renewal. We thought we were going to have to do this manually and rather than deal with hundreds of individual payments on random days of the year we decided to roll everyone over on just two days of the year. We published information about this on the website (now removed). As our first year rolled around we learnt that one of our accounting plug-ins sent out requests for payment and rolled it over on any individuals 12 month anniversary. So – we have gone back to this system. If you get a reminder or request to pay your subscription renewal it is all bonafide and if you want to retain membership and benefits please pay. We apologise for any confusion and rest assured we had as much as you did. Our Board of Directors is evolving with us. Katie Crafts has resigned to free up some space for other projects she is involved with. We can’t thank her enough for bringing her experience in the non-profit world to share with us. Her input has very much shaped the structure of our administrative procedure and practice and moved us in a much more professional direction. Brandon Harvey has chosen to move from an Advisory Board role into a full Board Member role. 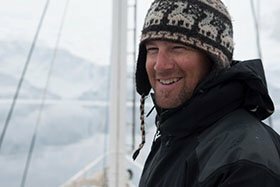 We welcome Brandon, his extensive industry experience and his strong belief in creating a profession for polar guides. Graham Charles is been driving the office and the larger PTGA projects (read the Newsletter) and preparing to run three Assessor Training courses between mid-October and mid-January (Hobart, Punta Arenas and on a vessel) for three of our Accredited Provider Companies. 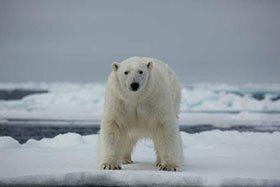 Phil Wickens is currently in Greenland on a contract with Quark Expeditions. Mariano Curiel is fully into planning the 18/19 Antarctic season, the A21 (Antarctica XXI) rebranding and the growth they are expecting while keeping one eye on son Justo who is starting to walk and climb. Alex Cowan was last heard from during a Board meeting he participated in on speakerphone while driving to the Alps to go climbing. His GPS had some good counsel during the meeting. 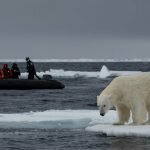 Heather Thorkelson has finished up her inaugural season with Twin Tracks Expeditions in Svalbard and is back at work coaching small business owners and getting involved in PTGA projects. Rupert Krapp has joined our Advisory Board and gives us an experienced, frank and discerning eye in the guiding and political world of Svalbard and the north. We have a month and a half to run with our grandparenting RCC scheme. If you have been a member for a while we are sure you understand the system and opportunity this represents. If you know senior guides in the industry who might be in transition between companies or roles and they aren’t aware of this please let them know. As the PTGA gains more and more traction in the training and assessment space you have to ask yourself what this will all look like in three years time. 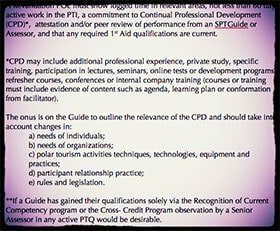 Already we are seeing companies using PTGA guide status as a key employment and salary indicator and we believe this will only become more prevalent as companies under huge growth pressure rely on industry-specific 3rd party vetting and measurement of guide competency. We offer a measurement framework that saves a great deal of time and effort from companies who just need to focus on capacity, permits and client satisfaction.We have a backlog of uncompleted reviews, please have patience while we work through them. 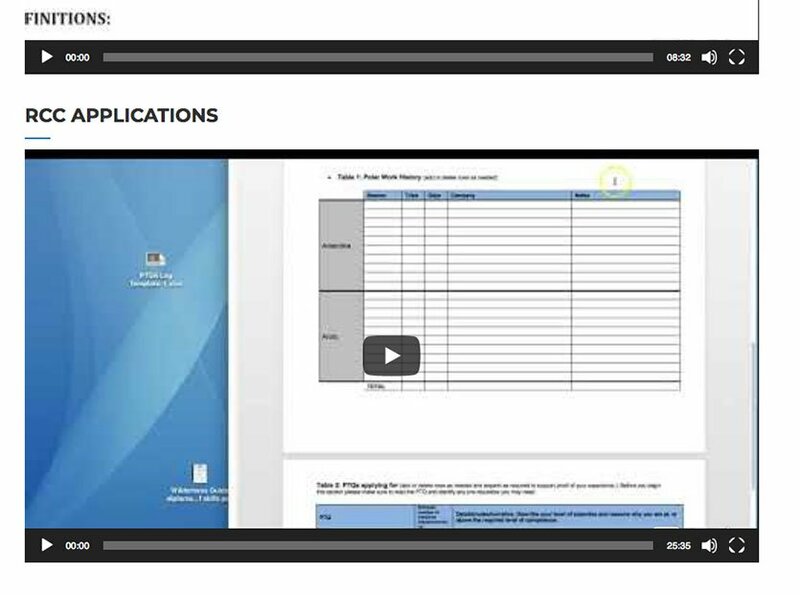 If your application is already with us before the October 31 deadline you are fine. It is the receipt time that matters not when the review is completed. It is an apt time to take a look at ourselves as an organization, the seasons are rolling over and focus is shifting. It has been just over a year since the Polar Tourism Guides Association launched and we received our first memberships. Already the risk we have taken to initiate this venture is paying off as we work to our mission statement of helping create and represent a bonafide profession. Here are a few highlights from our first year in full service. Representation at the annual IAATO Meeting and acceptance at future events as a relevant party to polar tourism discussion. First annual Qualifications Review Meeting to review, amend and develop our Framework based on real-world input from members and senior reps. Continuous feedback led review/amendment of our website and how it works. >Membership and Company membership exceeding our predictions and expectations. Fantastic uptake of our RCC grandparenting scheme by some of the industries most experienced practitioners, some of whom have submitted logs of a staggering (>1500) number of days of operation in the PTI. This represents undeniable support for a Guide led Association in this sector. Individual guide representation from ~90% of companies that operate ship tourism in the polar regions. Transpolar stakeholder representation from shipping, yachts and land-based operations. Three In-House Assessor courses booked to put upwards of 18 In-House Assessors into action during the 18/19 Antarctic season. First reports of shipping companies accepting PTGA awards as a legitimate acknowledgment of competency. An evolving Board of Directors well suited to our emergent needs and Advisory Board providing necessary and valued advice. ISO 21102 standard for our assessment structure, content and processes. Fiscal stability and budget forecasts that prove we are a sustainable model and able to keep developing. Thanks, everybody who has helped and supported us thus far. Onwards. 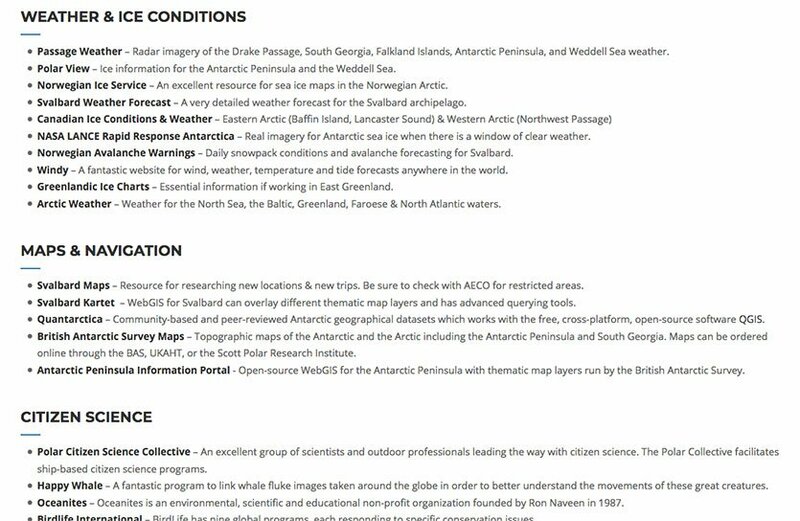 You can now find all the information you want about most things to do with polar guiding. We have collected a range of useful links for a professional guide at a one stop shop. If you are new to this resource but you have other links or apps a modern guide can’t do without please drop us a line. 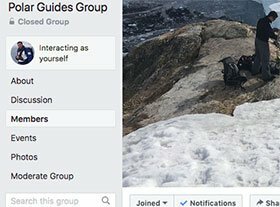 We have started a Guides Group where people can post their own experiences, thoughts, content and share science, news, happenings. Check it out and join up. 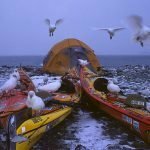 We would like this to be an easily accessible forum place for polar guides. With the backlash from the attack and subsequent shooting of a polar bear in Svalbard this season we have renewed our review schedule for this award. We received a lot of new interest/requests from industry to review the document and make comment. There is no other stand-alone award quite like this one out there currently and we feel the demand is very high but no-one else is taking the first steps so we will. We hope by collecting solid information from as many stakeholders in the polar north as we can and trialing it in the field that we might lay a foundation for AECO or someone else with an interest in standards to pick up and run with. We will continue to work on the syllabus over the coming months and have draft material to comment on early in the new year with the aim of it being ready for use prior to Arctic 2019 season. If anyone wishes to see it in order to help the review process please drop us a line. Oct 15/16 we are running an Assessor Training Course in Hobart. The course is for Aurora Expeditions but there are a couple of places available to join if anyone would like. Please contact us as soon as possible if interested. Updates to PTQs are normally left to our annual Qualifications Review Meeting but we have taken executive steps and made a couple of amendments to the syllabus (Elements 1.1 and 3.1 specifically). We made these changes as part of the requirements for our ISO audit to bring the syllabus into line with what ISO 21102 required. Please take the time to download the latest edition if you are using it for any training and development or assessing. The changes are mostly to bring two required areas into the award: 1. management of passengers in the zodiac and at any transition zones coming into or leaving, a drivers’ control. 2. that personal equipment used by a guide represents a professional standard of operation and presentation. The auditor reviewed all our material against the requirements for the ISO standard above. Even though the PTGA is NOT a tourism operator we do operate an assessment system that measures to the 21102 standard so it makes it a very relevant audit and ISO confirmation. The ISO standard is about tourism activity leader competencies across a wide range of needs and is largely to do with dealing with and managing people. In our Framework, we have a number of PTQs (Navigation, Radio and Comms, Presentation) that do not involve managing communication with, and safety of, clients. They are still important pre-requisites to our “active” PTQs (those with the direct and critical supervision of people). These PTQs cannot receive the ISO standard because of this, even though they are “part” of any of our activePTQs. All of our active PTQs (Lead a Hike in Non-Technical Terrain, Lead a Journey in Technical Terrain, Drive a Zodiac, and Sea Kayak Guide Polar Endorsement and any new ones in the future) will all receive validation of ISO 21102 and will carry the ISO pendant on them. What that means to you as a guide with these awards is that you are working to a vetted standard. Another section of the ISO audit was to look at our procedures for moderation and revalidation. We had left this purposefully vague to start with as it wasn’t going to be needed for a couple of years but now we have defined and designed a far more robust revalidation procedure that is worth looking through. If you have guide status with us you will need to understand what needs to be done when the first revalidations roll around starting in 2021. 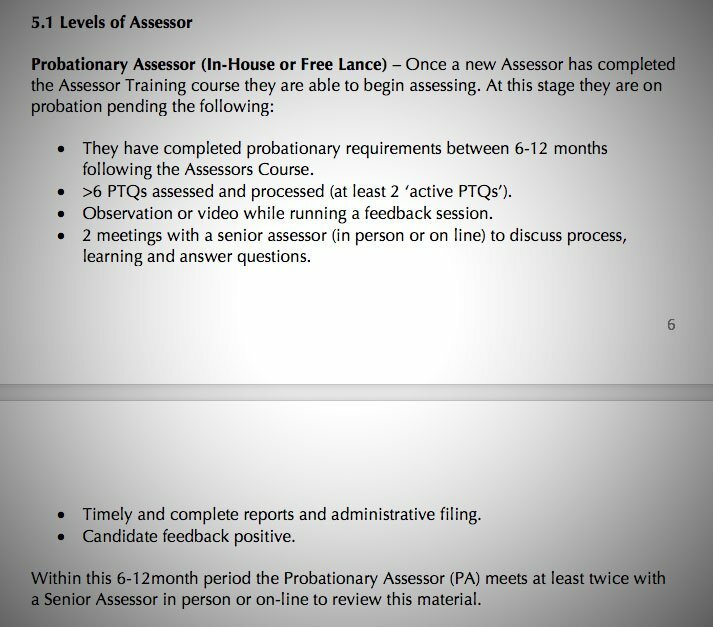 We have clearly defined our Levels of Assessor and the probation requirements for new assessors. 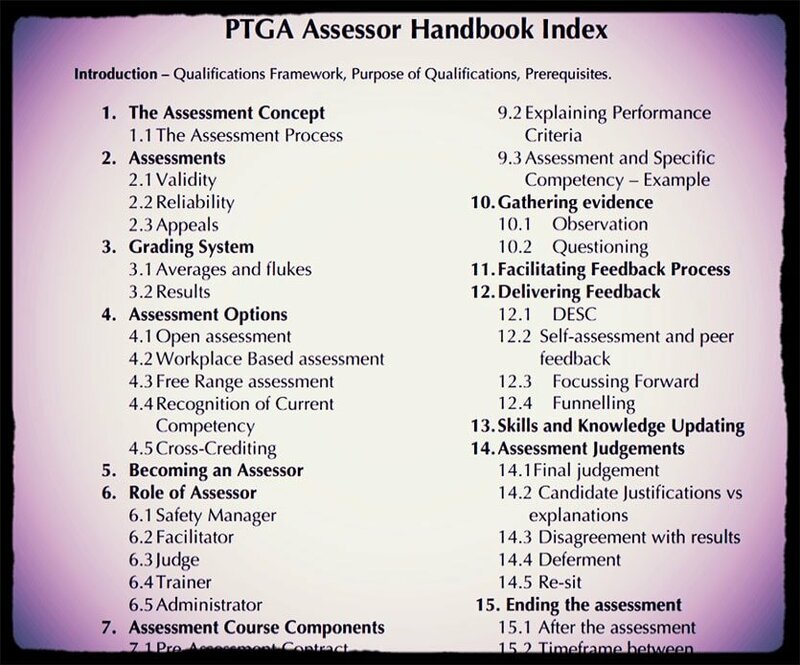 All this information is in the Assessor Resource Manual. If you are interested in becoming a PTGA Assessor please get in touch. Ben Wallis is the owner/operator of sailing vessel ’Australis’ he is a common fixture in the polar regions and many of you will have passed him in the Gerlache supporting Orca filming, seen him around Sth Georgia supporting all manner of media and private clients or anchored somewhere sitting out a storm. Ben, you have been doing this for a long time now and largely operate on your own or with one other crew under your own rules – why did you join the PTGA and apply for Recognition of Current Competency? Yachts are actually bound by layers of rules: I operate under Australian Antarctic Division authorization, Antarctic Treaty System guidelines and protocols, IAATO guidelines and finally flag state requirements. It’s intense! But, as my own boss, I decide if I want my operation to be PTGA compliant or not. 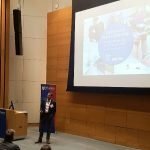 I do, and here’s why: a) I believe in what the Association is doing and, b) this is undoubtedly the way the industry is heading, so I joined to help the process. The RCC scheme was an obvious way to go because of my history and qualifications and it was good fun to compile and reflect on my own career and achievements. What is it about the concept of testing for minimum competency that you think might be beneficial for the polar tourism industry? A lot has to do with the rate of change that our industry is about to go through. 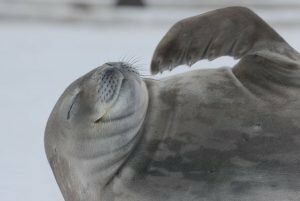 I believe that keeping a high standard of guiding during this change is very important to the visitor experience and for Antarctica. The places we go are so mind-blowing that I feel ethically and morally driven to help ensure that we have really good guides and we have a responsibility to provide the best, most knowledgeable, informative, safest and professional experience to the visitor that we possibly can. Are you concerned that testing and qualifications will just lead to generic guides with pre-packaged answers? Each person has their own style of guiding, I think a much more appropriate description would be ‘benchmarked’. I think it’s really valuable to have these PTQs clearly-identified as the pillars of a good polar guide. These can help guides reflect and improve. With such rapid change on the horizon, there is an unquestionable need for benchmarked expedition staff skills. If you are accredited or ‘benchmarked’ by PTGA it makes you instantly more employable compared to someone that is not. What relevance does the PTGA have to the polar charter-yacht scene? 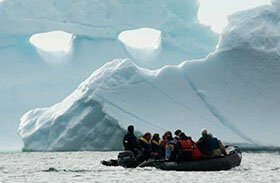 PTGA standardizes skills across the board, regardless of the transport of choice – a ship, a plane, a helicopter or a yacht it still provides a guided service for visitors to polar regions so it’s all the same. Small yachts often get ‘tarred with a dirty brush’ due to the bad behavior of the few that ruin it for the rest of us, so anything to help give “professional-yachts” credibility is worth it. What do you think are the biggest challenges for the industry in the next 5 years? Traffic, traffic, and more traffic!!!. On the peninsula, vessel interaction is already quite heated and if we are not careful it could get worse with the large increase in ships and passengers. Due to the short duration of voyages these days, the ‘hot spots’ are in high demand and we now see ships literally queuing up. 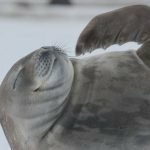 Favorite place in the polar regions and why? I feel most at home anywhere on the Antarctic Peninsula and love the ‘bigness’ of everything in the Ross Sea. Favorite polar hero and why? Amundsen… Unquestionably. He just did it. No faffing about, no song and dance or showmanship and bravado. He put in the time to learn the ways of the Inuit; how to live, work and function on the ice, which lead to his success. Scallywags like Matthew Brisbane (who almost nobody has heard of) I have a lot of respect for. With James Weddell, he went to 74 degrees south in the Weddell Sea as the Capt in a leaky old wooden boat built in 1800’s. He was wrecked three times in the South – once on the south coast of South Georgia. Over winter, he and his men built another boat out of the wreckage and tried sailing back to the Falklands, but got blown to Montevideo. The 10 men that waited behind for the relief boat, continued sealing for the second winter. An absolutely amazing feat that is so understated. Ohhff, tough one, It changes regularly. It used to be the big marine mammals – of course. But, I caught my first Antarctic (red) Dragonfish last year so that’s definitely one of the latest favorites. I think a lot of benthic life in Antarctica has interesting stories to tell because we don’t get to see much of it and it doesn’t get much coverage. Our Forum page for member discussion is live. Check it out and feel free to open a topic for discussion.